Casta Diva, pictured in a training gallop, has won her first race in Japan. White New Zealand bred thoroughbred filly Casta Diva has won her first race in Japan. 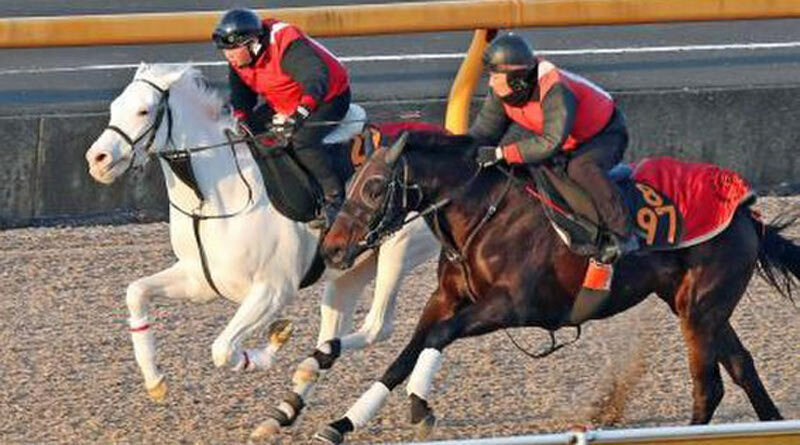 Casta Diva in race training in Japan. The three-year-old filly was successful over 2600 metres at Hakodate on Saturday in her fourth raceday appearance, picking up ¥5 million ($US45,000) in stakes money in the process. The move up in distance must have suited the filly, as she’d been unplaced in two starts at 1800m and third in May in another 1800m race. Casta Diva is trained by Yasuhito Tamura, who prepared 2015 Champion Two-Year-Old Filly Major Emblem. She was bred by Windsor Park Stud and sold by them during New Zealand Bloodstock’s 2016 Premier Sale at Karaka to Hideo Takadura for the Dearest Club for $450,000. She is by High Chaparral and from the white mare The Opera House, a three-quarter sister to the former two-time Australian Horse of the Year Might And Power. The Opera House’s white Shamexpress colt sold earlier this year for $510,000 to the China Horse Club and Ciaron Maher Bloodstock. Because of the rarity of white thoroughbreds, The Opera House (by Zabeel) made headlines around the world when she was born at Cambridge Stud in 2006. She was the first white thoroughbred to be sold at auction in Australia in 2008, fetching $A280,000. Last season in Japan coloured racehorse Buchiko gained cult status and was credited with drawing crowds back to the races. From a pure white mare, Buchiko has a white base coat and is splashed with chestnut spots.